I got a Fitbit for Christmas and have loved it! I’ve loved how it effortlessly tracks my physical movements, and I love how it pushes me to remain active. There have been times when, near the end of the day, I’m prompted to take “just 834 more steps” in order to reach my daily goal. And so instead of digging into another bowl of ice cream, I’ll get my lazy self off the Lazy Boy and take a few laps around the house. Sometimes I’ll even throw in a flight or two of stairs for good measure. 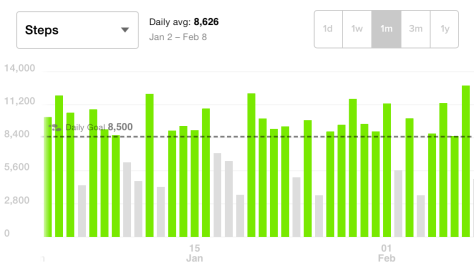 I didn’t used to do that, and so in one sense, continually reviewing my Fitbit data has been a very good thing. Fitbit allows you to effortlessly monitor the number of steps taken over time. In spite of these wonderfully helpful nudges toward desired behavior, nevertheless, I’ve learned that life with the Fitbit also comes with a dark side to it. Because the device can only record the data it measures, I’ve yet to get it to function while not wearing it. As a result, there have been numerous occasions when my children have heard me grumble because I journeyed to the basement storage room “without getting credit.” Can you imagine climbing stairs without anyone there to notice?! Or ever so refreshing; depending, of course, on your perspective!